Few things are as fun and fulfilling as being a pet owner, but when we have furry friends taking comfort in our domiciles, we have to be a little extra vigilant when it comes to maintenance around the home. For instance, did you know having a pet affects your air conditioner and how it operates? It’s true! Today, we’re going to pass along some helpful tips for pet owners to keep in mind so their air conditioners work properly at all times. Here in Florida, air conditioning is vital to a comfortable home. For air conditioner maintenance in Titusville, call Altman’s Cooling & Heating today! 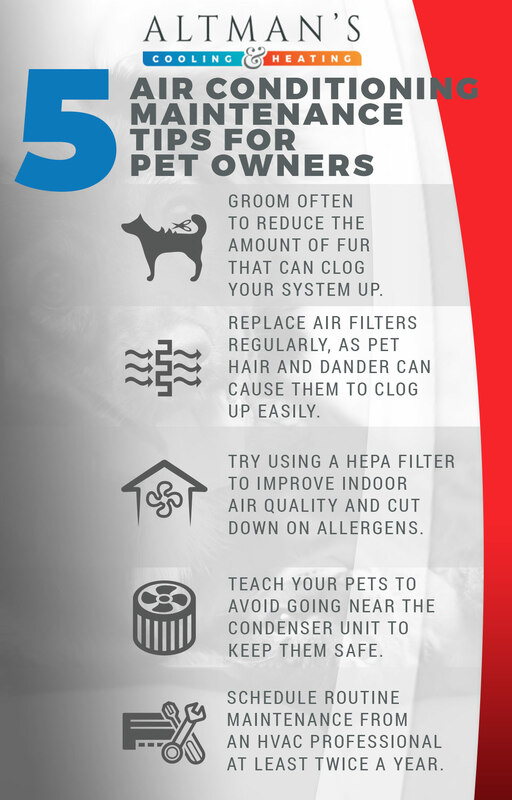 No matter what type of four-legged, fuzzy companion you have, keeping them groomed is incredibly important when it comes to your air conditioner. When you regularly groom your pet, you can minimize the amount of fur that is put into the air. That hair will get sucked into your air conditioner, get clogged up in your system, and cause it to work harder and shorten its lifespan. Additionally, this will help cut down how much dander, dust, and pollen are in the air, which can cause severe pet allergies. Make sure you’re vacuuming regularly as well, as that will catch what they may have shed in between trips to the groomer. Your air filters are just as important to your air conditioner as a filter is to your car. It catches all of the particles that are floating through your air and prevents them from being cycled through. Because most pets are notorious for shedding, your air filter may get clogged up faster than normal. Check it regularly, clean or replace it when necessary, and you’ll keep your air clean and clear. The next time you need to replace your air filter, it’s a good idea to consider going with a HEPA filter. HEPA filters, (which stands for high-efficiency particulate air) help to reduce the amount of allergens and particulates in your house’s air supply by as much as 99.7 percent. The way it works is the filter grabs the microscopic dander, hair, or other particle, and locks it in so it can’t go back through your air conditioner while it runs. This is especially a good idea for households with allergy problems. The previous tips were focused on what happens inside your home, but if you know anything about air conditioners, you know that’s only half of the story. Your air conditioner will have an outdoor condenser unit that helps it operate. It’s important that you train your pet not to go near the outdoor unit to keep them safe in the event a refrigerant leak occurs or they get caught in the fans. We recommend building a small fence around the outdoor unit to keep your pets out. All air conditioners, regardless of the pet situation, need to be maintained on a regular basis to keep them running properly. Many HVAC companies offer maintenance plans to ensure you’re always on the schedule, so you don’t have to worry about it. Do you want to make sure your air conditioner is working properly? Call the HVAC pros at Altman’s Cooling & Heating! While we are located in Titusville, we’re proud to serve Merritt Island, Port St. John, Cocoa, Cocoa Beach, New Smyrna Beach, Cape Canaveral, Mims, Rockledge, Sharpes, Wedgefield, Edgewater, and Oak Hill. Call us today to learn about our new customer special.